The GBP/USD currency pair traded at around 1.3040 level on Wednesday after the most recent pullback. The pair continues to trade within a tightening range with immediate support and resistance zones now separated by about 100 pips. This indicates that the pair is consolidating in the short-term with a potential breakout just around the corner. The currency pair has pulled back following another tepid inflation data from the Bank of England. The latest inflation data for March missed expectations with 1.9% versus the 2.0% forecast. Concerns about the stalled government talks, especially regarding the Brexit are also adding pressure to the Pound Sterling. However, recent UK employment data, which showed that the labor market’s unemployment rate remained steady at 3.9%, the lowest level in 44 years, indicates that the country’s economic situation remains strong. Whether the geopolitical uncertainty affects it in the near future remains to be seen. On the other hand, the US continues to show strength following the recent jobless claims data, and this will continue to boost the greenback. 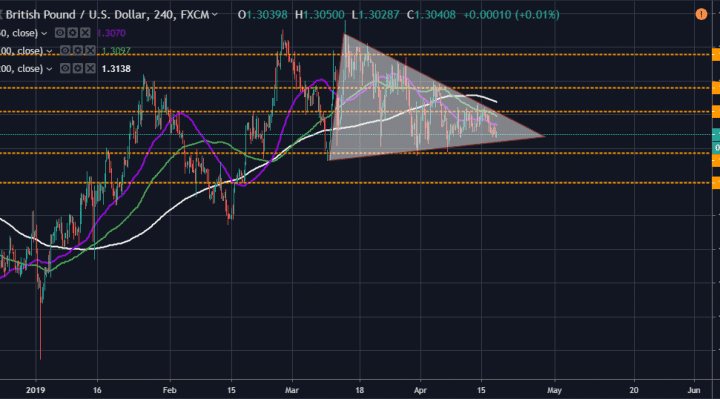 From a technical perspective, the GBP/USD currency pair appears to be trading within a symmetrical triangle formation, which suggests that the pair is consolidating in preparation for a potential breakout. This creates some interesting trading opportunities for traders. As such, the bulls will be targeting profits at around the 1.3100 level while the bears will hope that the current pullback breached the lower trendline of the triangle by targeting profits at around the 1.3000 level. 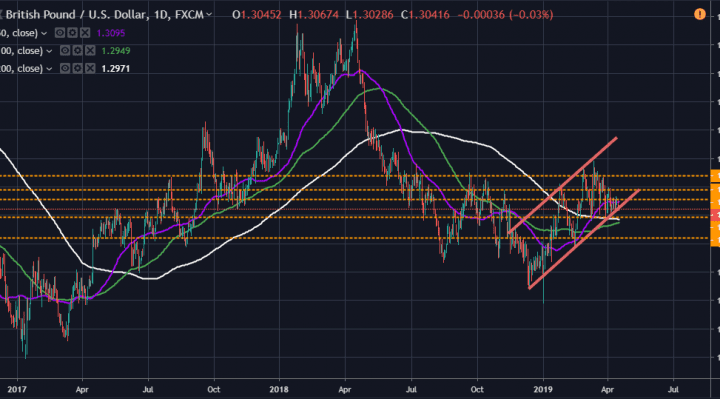 In the daily chart, the GBP/USD currency pair appears to be trading within an upward trending channel and looking at the pair’s latest move, it appears to be about to bounce off the lower ascending trendline. But then again when you compare the daily chart to the 240-minutes chart, the picture in the daily chart would suggest that a breach of the lower trendline could be on the cards. As such, while the bulls will claim to retain short-term control, the bears will know that a downward breakout is inevitable especially given the uncertainty around Brexit. In summary, the GBP/USD currency pair appears to be headed for a breakout following the current consolidation. However, after the pullback, the bulls will be optimistic for a rebound off the 1.3040 level.